Fish pox, which is also called carp pox, is a disease which commonly afflicts both koi and goldfish. Like many other illnesses, prevention is better than treatment, and it is important to recognize the symptoms when they first appear. How Do Fish Develop This Condition? Fish pox is actually derived from a herpes strain, which is referred to as HPV-1. It mostly affects the scales or skin, and the usual transmission route is when healthy fish share a pond with fish that have it, which in turn can quickly lead to an outbreak. Currently, experts aren’t sure how the virus moves between fish, or how certain specimens develop the condition, whereas others do not. What Symptoms Are Associated With Fish Pox? Fish that are afflicted by this disease will display a growth on their fins or scales which are white, grayish or pink. It is also recognizable by its waxy appearance and the growth may vanish and reappear multiple times. Initially, during the earliest infection stages the pox will appear as lesions on the skin that are smooth and rose. Aside from making the fish appear ill, if they are exposed to this virus for extended periods of time their immunity will be compromised, which increases their vulnerability to other infections. The skin lesions in particular might cause secondary infections. As with most viruses, there is currently no cure for fish pox. The standard treatment methods such as the addition of anti-parasitic within the water, as well as bathing fish in solutions containing salt have largely been ineffective. However, in some cases pond owners are surprised to learn that the condition may resolve itself. Unfortunately like any virus fish pox never truly disappears, but will instead stay dormant and may flare up in the future. The danger of course is that if and when the condition flares up other healthy fish within the vicinity of those infected are at risk of contracting it. Therefore, any fish which displays symptoms of fish pox should be immediately quarantined. This will protect the fish which aren’t infected, and after quarantine has occurred, the afflicted fish should not be added back to the main pond, even if their symptoms subside. Pond owners must also exercise great care before adding new fish to their ponds. Just because a new fish appears to be healthy doesn’t mean it is. 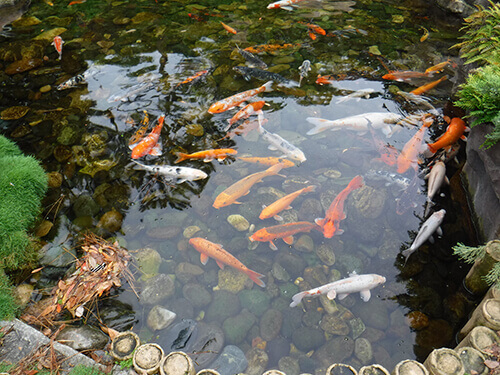 Remember, viruses can remain dormant, and given the high cost of certain fish such as koi, serious pond enthusiast cannot afford to put the health of their other specimens at risk. Therefore, new fish should be quarantined and carefully inspected before adding them to an existing fish population. Ideally, a new fish should be quarantined for over a month if possible, and then take a fish from your existing stock and place it in the quarantine tank and then see if it develops any signs of disease.